We are Alabama Astrobotics, a robotics team at The University of Alabama that competes each year in NASA's Robotic Mining Competition at Kennedy Space Center in Cape Canaveral, FL. In addition to designing, building, and testing our robot throughout the year, we coordinate and participate in several outreach efforts with the University of Alabama/Tuscaloosa community. Our goal is to ignite a feeling of excitement within K-12 students for pursuing STEM careers. There have been many early mornings and late nights in our new lab already. The team is putting in a lot of work to make this another great year! Just before winter break, the team put on their khakis and braved the cold weather to pose for our 2018-2019 team picture. Alabama Astrobotics team went over the initial design for parts of the robot. We are well on our way to the RMC this May! The children of the RISE school attended a fun trick-or-treating session at H.M. Comer on the University of Alabama campus. Our team created a candy off-loading belt to fill the kids' buckets with loads of treats! The 2017-2018 Alabama Astrobotics team achieved a tremendous feat at RMC 2018, becoming 5 time national champions! Our team was able to mine past 12 inches of BP-1 to reach a layer of icy regolith and transport the regolith to the designated off-loading bin. We are so proud of last year's team and looking forward to another exciting and successful cycle. We've come a long way on Bailey's car, check out all these modifications! HUGE thanks to Dynetics for partnering with the University of Alabama College of Engineering and Alabama Astrobotics to invest in the future of so many students. Team members (L to R) Alison Varner, Max Eastepp, Rebecca Dietz, and Jonathan Blake were honored to meet with Dynetics representatives and accept a portion of the donation on behalf of the team. The article detailing the donation can be found here. 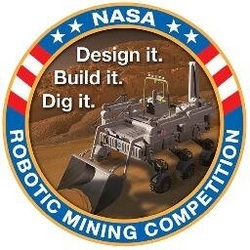 Alabama Astrobotics competes in NASA's Robotic Mining Competition, a competition in which university-level students design and build a mining robot that can traverse the simulated Martian chaotic terrain.